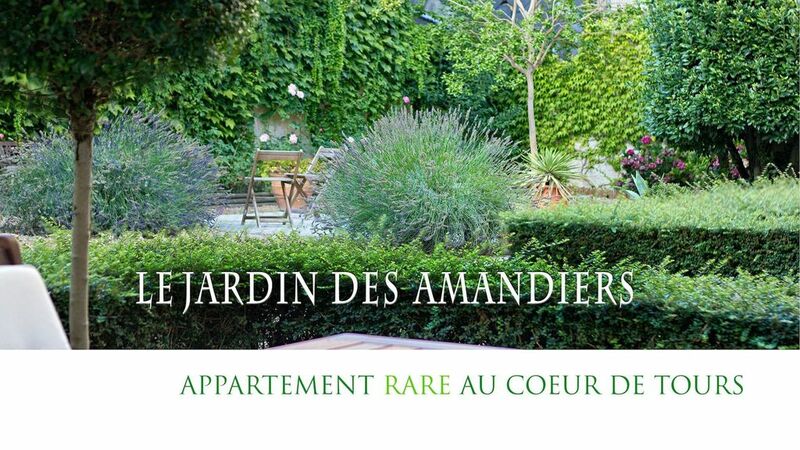 The Almond Tree Garden is a rare flat, located on the ground floor of an old 15th c. commandery. It has a large garden, a wide dining room, a wide bed, a large freestanding bath, a large cinema screen ... right in the center of Tours, and yet in an amazingly quiet location. The flat is situated in the neighborhood of the Cathedral, near the most attractive spots in town. Within walking distance, discover the historical district, the Cathedral, the Grand Theater. The best restaurants are only a few meters away, and it will take you a few minutes to park in the adjoining private car park. After passing the entrance, you will cross the courtyard and the garden before reaching your flat. You can lunch on the terrace, on the large table, or walk straight into the kitchen. Why not indulge in a authentic Italian espresso, made with freshly ground beans in the coffee machine? You may want to settle on the sofa to calmly prepare your day's schedule. The wifi fiber connection allows you to surf the Internet at high speed. The large remote control allows you to lower the projector and manage the home cinema equipment. You can watch TV programs or blu-ray movies on the sofa or on a platform. Wireless headphones allow you to turn upside down. You can also relax in the large freestanding bathtub. The bathroom is equipped with loudspeakers fitted in the walls, and with customizable mood lighting. The house was built during the unification of the city of Tours in the 12th c., As part of Henri II Plantagenet's city wall project. It belonged to the Commandery of the Order of St. John of Jerusalem of Amboise. The oldest remaining parts date back from the 15th c. The main building is set over two storeys of vaulted cellars from which several underground passages are allowed to escape and find refuge, for instance in the Cathedral. Joan of Arc is said to have stayed there when she came to Tours in 1429 to have her armor made by Master Armorer Colas of Montbazon whose workshop was in the same neighborhood, in the Rue Colbert. The motorway exit labeled "Tours Center" on the A10 allows you to get to the flat in 5 minutes. Beautiful apartment in great location! Really well appointed apartment. Quiet and safe, with a large beautiful garden. The host was very nice and available to answer questions. Jean-Philippe was waiting for us on arrival and welcomed us into his beautiful apartment. The apartment is exceptional in its design and every detail has been thought through from the gorgeous bathroom with super large tub, rain shower and mood lighting to the wooden clad kitchen and dining area. The outdoor space is wonderful as are the neighbours! Just a 30-second walk and you are on a street full of bars and restaurants galore or a couple of minutes in the other direction takes you to the Cathedral, Château and the Musée des Beaux Art with its stunning gardens (http://www.mba.tours.fr/), but the apartment is so quiet you could hear a pin drop, an amazing restful place to be. Tours itself is full of vibrancy and life especially if you hit the longest day when the streets fill with Fête des Musique - free music around every corner! Fête des Jardin at the Domain Chaumont-sur-Loire (http://www.domaine-chaumont.fr/) absolutely blew our minds - thank you Jean-Philippe for recommending. We were greeted with friendly faces everywhere we went. We will definitely return and stay in Jean-Philippe's apartment again if he will have us! Thank you so much, this has been a holiday to remember. Thanks for your great review! It was a pleasure to host you! You are welcome back anytime! Denise and Nigel are wonderful interesting people. They are a lovely couple. They are really respectful and they took wonderful care of the apartment. I hope you will have the same pleasure to welcome them. On our arrival our host Jean-Philippe met us with a warm welcome. Patiently he made sure that we were well informed about the operation of the modern appliances with which the apartment is well equipped. Located in an interesting part of Tours close to the cathedral and many restaurants, the apartment provides a tranquil secure haven near the Loire River. Jean-Philippe has created a special environment and is clearly keen for his guests to enjoy it. We stayed for one week and loved every moment in the apartment and in Tours. It was an absolute pleasure to host Jill and Harry! They are so sweet and appreciative. Everything they do is with smile and "joie de vivre". They took wonderful care of the apartment. I hope you will have the same pleasure to welcome them. Everything was made convenient and comfortable in the flat.....great attention to detail. Quiet location near the Loire and easy to find from the train station. Très beau appart de 50 m2 équipé de prestations luxueuses, tel que sur les photos. Confortable, douillet, parfait pour un couple. Le parking privé situé juste à côté, la tranquillité de l’endroit ont influencé notre choix. Idéalement situé, tous les commerces, bars, restos, magasins ne sont qu’a une quinzaine de minutes à pieds (vieux Tours). De plus, la ville Tours vibrante le soir avec tous ces bars et cafés, est situé en plein centre de la région et on peut facilement accéder aux routes et autoroutes pour visiter toute la région de Val de Loire (Châteaux, vignobles, forêts, etc.). Le propriétaire Jean-Philippe est un hôte hors pair qui nous accueille, nous conseille, et est d’une grande disponibilité. Cessez de chercher, vous pouvez réserver cet appart les yeux fermés. Je la recommande haut la main pour toutes ces raisons. zwei Personen braucht zum perfekten Stadtaufenthalt. Wunderbar ruhig im Innenhof gelegen, mit schönem eigenem Sitzplatz.